This project was a bit of a challenge, but we are happy that our customer liked it as much as us. The original plan was to prepare this steel railing with a mirror finish before we went to our plating specialist. However, when we showed this to the customer, they were so happy with the mirror finish that they decided to keep it as it was. If you're interested in the finish quality, look through this slideshow: the pre-installation photos show the finish better (with fewer fingerprints). We recommend going with steel plating, aluminum, stainless steel, or another nonreactive material and plating if you plan on putting projects in high traffic, wet, corrosive, or otherwise difficult areas. Still, if you're looking for a tubular structure polished to a fine finish, we can do that for you. This railing was used at an exhibit trade show in an interactive product booth to funnel people toward touchscreen demonstration stations. It was important to our customer that the railing was minimal enough to keep focus on the demonstration platform, but strong enough to stand up to tired, leaning exhibit-goers. Though it looks like one solid piece (thank you very much) the finished product was actually separate pieces which could be added or removed based on crowd size; this made the transportation of this project much easier than we thought it would be. To keep with the desired aesthetic, we prepared this railing for a finish before shipping; the customer powdercoated it. This machined, drilled and welded piece shows off the precision of our welder. He takes quite a bit of pride in his work: notice the bead and the uniform discoloration on the underside. A simple piece, but we still take pride in it. 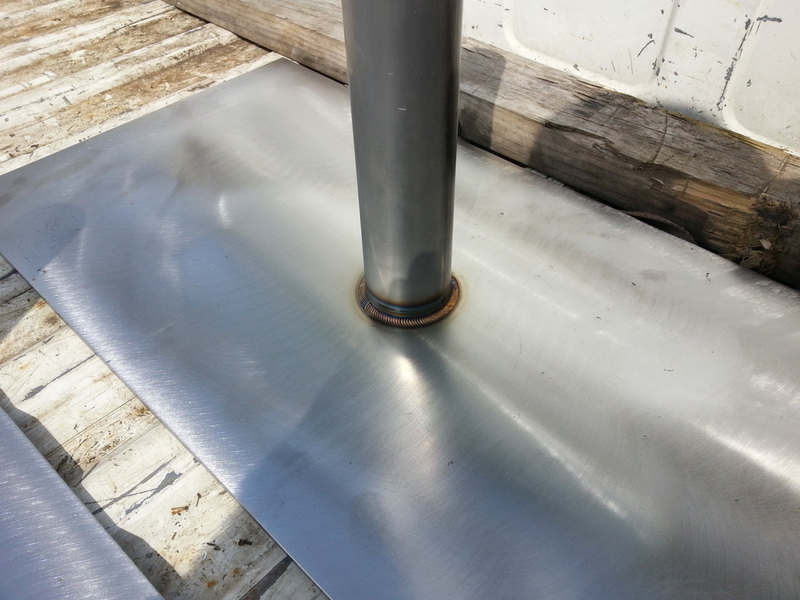 If aluminum base plates just won't do, we have plenty of experience with steel as well. This type of base plate is often used to add weight and strength to a wall, structure, or island, whenever it can be hidden from direct view. Of course, if you prefer steel over aluminum but still need something attractive, we offer finishing options from brushing to plating to mirror-finishing. At the moment, this bridge is just a skeleton of what it will be. Still, you can see the proprietary hinge and support system that was specifically designed to accommodate the weights to which it will be subjected. After we apply the substrate, this span bridge will be ready for work and play. We've used these vises for years and we've definitely gotten our use out of them. Still, they are rock solid and after a wipe down they still look nice. As one of the first shop-specific products we produced, we all know that we wouldn't be successful if we hadn't made these vises when we did.